The cables on your garage door can and will have issues as your door gets used on a daily basis. General wear and tear can cause your cables to snap, loosen, break or come off the drum. We often repair broken this component of the system. The cable is a part that is used a lot in the operation of the door so it takes a lot of stress. The tracks installed with your door will also undergo a certain amount of damage over time to the point that they may become bent or broken to the point of replacement. If there is a bent track or a track that is off balance and it is left unrepaired it can cause major damage to your garage door if left undealt with. Replacing the tracks on your garage door is slightly more expensive than a cable repair; however far less expensive then replacing your entire door and its components. We advise you to contact us early on if you think there may be an issue here. In Need of Spring Replacement? Torsion springs are usually the most dangerous when it comes to malfunction. They have been known to snap and cause serious harm. They are usually used to operate heavier style doors and are located at the top of the door. Extension springs can also be dangerous – if you notice considerable wear on your springs or find your door dropping fast each time you use it, this can be a sign that the springs need attention fast. 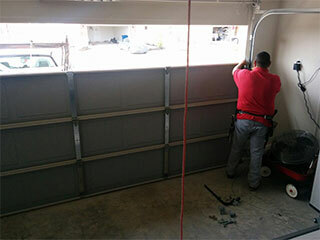 Our experts at Garage Door Repair Escondido are here for you whatever your garage door need may be. From repairs, replacements to installations, we can do it all. Great service, great prices and dependability – just give us a call to find out why we are the best garage door repair company in the area!